Until recently, Georgia's state government had the longest unbroken record of single-party dominance of any state in the Union. For over 130 years, from 1872 to 2003 Georgians only elected Democratic governors, and Democrats held the majority of seats in the General Assembly. The state capital is Atlanta. As with all other U.S. States and the federal government, Georgia's government is based on the separation of legislative, executive and judicial power. Executive authority in the state rests with the the governor, currently Sonny Perdue (Republican). The Lieutenant Governor, currently Mark Taylor (Democrat), is elected on a separate ballot. Both the governor and lieutenant governor are elected to four-year terms of office. Unlike the federal government, but like many other U.S. States, most of the executive officials who comprise the governor's cabinet are elected by the citizens of Georgia, rather than appointed by the governor. Legislative authority resides in the General Assembly, composed of the Senate and House of Representatives. The Lieutenant Governor presides over the Senate, while the House of Representatives selects their own Speaker. The state Constitution mandates a maximum of 56 Senators, elected from single-member districts, and a minimum of 180 Representatives, apportioned among representative districts (which sometimes results in more than one Representative per district); there are currently 56 Senators and 180 Representatives. The term of office for Senators and Representatives is two years. At the federal level, Georgia's two U.S. senators are Saxby Chambliss (Republican) and former governor Zell Miller (Democrat). As of the 2001 reapportionment, the state has 13 congressmen and women in the U.S. House of Representatives. 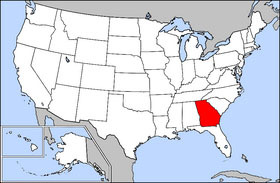 Georgia also has 159 counties, the most of any state except Texas (254). Before 1932, there were 161, with Milton and Campbell being merged into Fulton at the end of 1931, during the Great Depression. Gwinnett County was named after Button Gwinnett, one of the delegates from Georgia who signed the U.S. Declaration of Independence. Counties in Georgia have their own elected legislative branch, usually called the Board of Commissioners, which usually also has executive authority in the county. 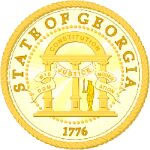 Georgia's Constitution provides all counties and cities with "home rule" authority, and so the county commissions have considerable power to pass legislation within their county. 7.3% of its population were reported as under 5 years of age, 26.5% under 18, and 9.6% were 65 or older. Females made up approximately 50.8% of the population. Nearly half of the state's population lives in the Atlanta metro area. Georgia Public Broadcasting (GPB) operates nine major educational television stations across the state as Georgia Public Broadcasting Television. It also operates, in whole or in part, several radio stations as Georgia Public Radio (GPR).